Model T Ford Forum: Old Photo - Disc Wheel Equipped 1924 Ford Coupe? Old Photo - Disc Wheel Equipped 1924 Ford Coupe? Model T Ford Forum: Forum 2014: Old Photo - Disc Wheel Equipped 1924 Ford Coupe? 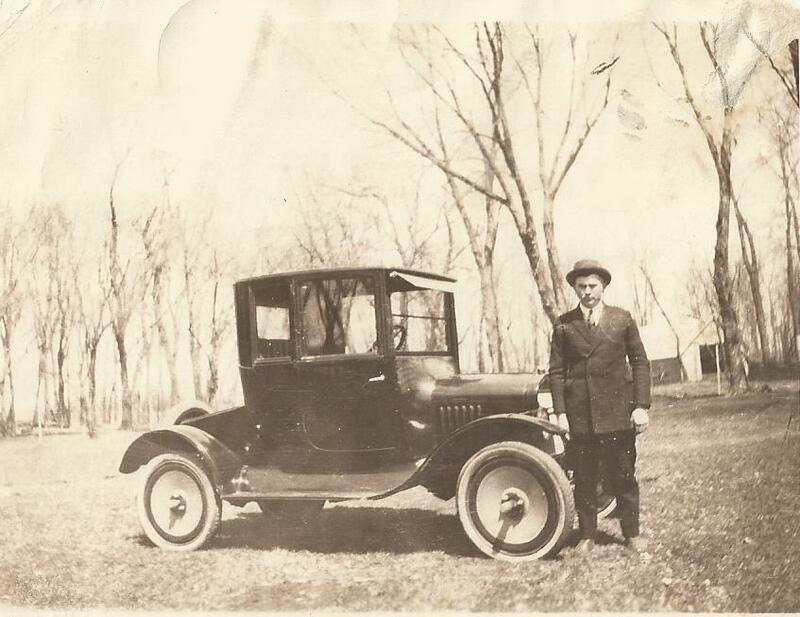 Backstory: My grandpa bought a 1924 Ford Coupe (engine # 10847606) for $525 on 11 Dec 1924 in Iowa. He married my grandmother in Nov 1925 and they immediately left on a 5 month road trip across the western US. They sold the car in California at the end of their trip and evidentially the person that bought it was later killed in a car wreck with it. The car is not a 24 Coupe. You can do a search of the photos on the MFTCA and clearly see the difference. Up until 1922 the Ford Coupe doors were hinged in rear. Starting in 23 the Coupes doors were hinged in the front. There is some question when the cars were actually a 23 that had the cowl vent and front hinged doors. The late 23 thru 25 had a cowl vent also. The earlier coupes didn't. The main body on the earlier coupes are a little different overall than the 23-25 Coupes and to me seem a little smaller than the later Coupes. I have a 24 and it is definitely different than the earlier ones. The wheels are definitely Disteels. It could have been left over stock sold in 24 as a 1924. Like those wheels. It does look like the later style door handle used on the earlier coupes. I don't recall when they first started using that handle, but I think it was '21 through the end of the earlier coupe production, basically summer of '23. Earliest coupe door handles were bale type. They were followed by a "T" sort of handle. The shaft was in the middle of the straight handle. Somewhere around late '21 or '22 model, the shaft was moved near one end of the straight handle. Cars often did sit in showrooms for quite awhile. Sometimes that while could be more than a year. They were often (not always) sold as the current year at the time of sale. And regardless of what the dealer called it, many states licensed the car as the year sold, not when it was built. Even though that coupe is clearly an earlier style/model, it could have been sold as a '24, even when it was basically new. Neat car! Thank you for sharing the picture, David. Thank you all for your input and expertise. Grandpa for sure did take a 1924 Model T Coupe to California but it seems like this photo is not that same car. I have now found an insurance policy paper for a Ford Tour. (type) Factory No. 3603753 22 1/2 HP 4 cylinder $660.00 1919 (year built) 1920 (year bought) car. Do you think the car pictured could be this car? Kristin, the Tour designation seems to be for a Touring model car witch would be a three door, two seat, 5 passenger open car. Witch? Which? Whitsch? No, I'm stone sober! Stupid auto-correct. Or ought to cur wrecked or whatever!